Hang Luoc Flower Market opens once annually before Tet – a traditional holiday in Vietnam, thus it attracts thousands of people to visit and go shopping. Renowned as the oldest market in Hanoi capital, Hang Luoc Flower Market always evokes the soul of traditional Tet inside Hanoians, the citizen of a dynamic cosmopolitan city, for the result, Hanoi Local Tour desires to give tourists the upcoming Tet atmosphere in Hang Luoc flower market. The age-old flower market was established in the first years of the 20th century, Hang Luoc flower market is the only market opened annually on Hang Luoc (the comb), inside Hanoi Old Quarter, it starts from the 23rd day of the last month of the lunar calendar until New Year’s Eve. Dating back to the Le Dynasty, Hang Luoc belonged to Phu Tu Hamlet and Vinh Tru Hamlet, Dong Xuan district nowadays, old Tho Xuong district, it specialized in making combs. In 1912, Hang Luoc became famous flower market of imperial Thang Long Citadel with many kinds originally from Quang Ba, Nhat Tan peach, Ngoc Ha daisies,… just with a length of 264 meters connecting Hang Cot to Cha Ca. Hang Luoc flower market has existed for over 100 years from the beginning excluding New Year in 1947 due to the war. From the 15th to 30th days of the last lunar month, Hang Luoc street becomes a bustling flower market where Hanoians come to buy flowers as the peach branches and kumquat trees selected carefully from traditional villages around Hanoi as Tu Lien, Nhat Tan, Ngoc Ha, and Quang Ba. In these days before Tet, no matter how crowded the flower market is, people try to visit it to catch the early spirit of spring, take some photos, and enjoy the beauty of brilliant blossoms. Perhaps people come to Hang Luoc flower market neither buy nor sell, they just come to Hang Luoc to feel the elegance and joy surrounding. Prepare for the annual flower market in Hang Luoc, flowers, lanterns, clothes, and other products have been selected, transported, and displayed on each booth, which helps visitors easily pick their favorite items. 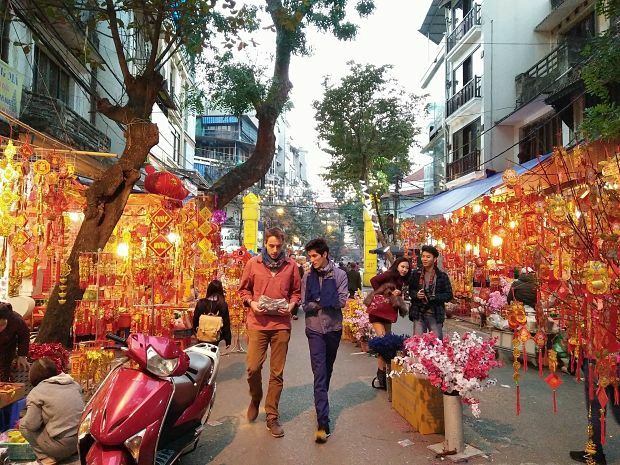 Actually, along Hang Luoc Street, there stands a typical red and yellow color of traditional Tet fulfilled and it’s also the ideal place for the young to check-in and find some souvenirs. Although it’s too crowded, the florist area is the most bustling place because cherry blossoms are the indispensable part of Tet in the North. 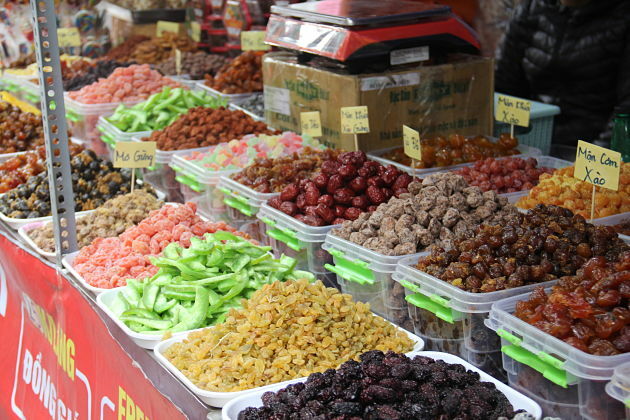 Hang Luoc flower market not only satisfies our sight but also feed our taste by eye-catching sweeties, dried fruits, jams, and many savory street foods. Hanoi within a month before Tet holiday has become more bustling than other days, but to find the authentic taste of Tet besides Hang Luoc flower market, Hanoi Local Tour team suggests travelers a few places for the unforgettable experience. Visit Kim Ngan communal house on 42-44 Hang Bac Street to feel the Tet celebration of the traditional Hanoian family, the visitor gets a deeper insight into how a traditional meal for New Year’s Eve is prepared. Meanwhile, Heritage House on 87 Ma May Street will perform the Tet celebrations in the past and Vietnamese bonsai as well as tea culture. Hang Ma street cannot miss in the pre-Tet holiday is a popular place in Hanoi Old Quarter for visitors to indulge in the festive pre-Tet atmosphere, in which full of the array of brilliant lanterns, envelopes for lucky money, and colorful decorative stickers symbolizing prosperity in the new year.